Have you ever bought an item and couldn't, for the life of you, figure out if it was meant to be a top or a dress? Well, the bad news is that it could remain a mystery. Good news is you've managed to kill two birds with one stone. In other words, you can wear that item as a top or a dress! That's exactly what I did with my black top/dress. When I saw it in the store, I wasn't quite sure what it was supposed to be, but I decided to worry about it later and got it anyway. I tried it on at home I realized I could wear it both ways and here's how it works. 1. Pair the item with what you'll usually wear any top with, such as a skirt, pants, jeans, leggings or shorts. However, your choice has to create the illusion that you're wearing an actual top. You don't want people to wonder if it's a dress. 2. Accessorize appropriately. This would depend on your choice of bottoms. If in spite of your pairing it's not convincing that you're wearing a top then wear accessories that would help prove your case. For instance, you can wear a belt because it would help shorten the length of the dress/top. It would depend on where you're wearing it to. If you're wearing it to a party, throw on some heels, wear popping makeup and everyone would assume you're a pretty girl wearing a flirty short dress. If you're running errands, wear flats, sandals, or sneakers and become that girl in that easy breezy itsy bitsy dress! In addition, try to work with the item and see what works with it to make it look more dressy. Avoid belts as that would reduce the length of the dress. So how did I make this work for me? In a previous post, titled Why Accessories Are Important (see pics below), I wore this piece as a top paired it with a skirt. I had the shoulders up to my neck to shorten the length. 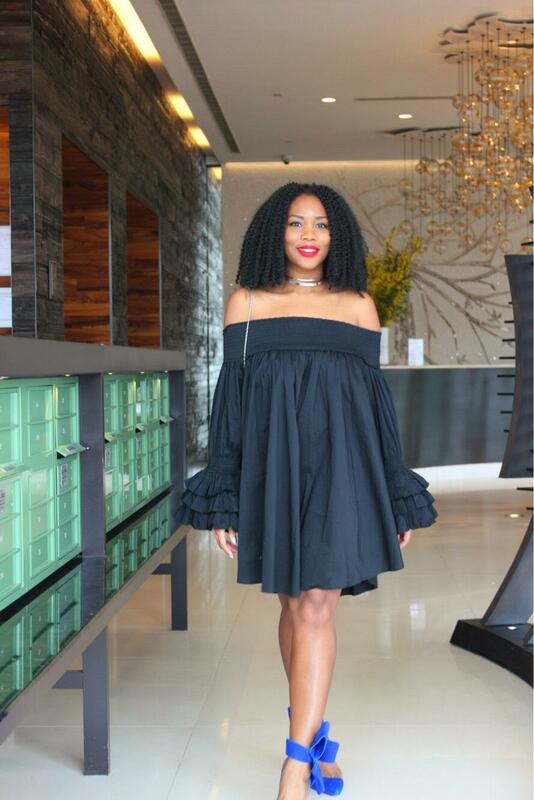 In today's post, I'm wearing the same piece as an off shoulder dress. Obviously, I chose to have the shoulders down to increase the length of the dress. I paired it with flashy heels and makeup and my look was completely transformed. Go to your closet and find a top to transform into a dress and vice versa. Wear two outfits in one buy, ha!